Ashes from sugarcane were analyzed by X-ray fluorescence, ash content, X-ray diffraction, scanning electron microscopy (SEM), and energy dispersive spectroscopy (EDS). FactSage 6.4 database software was used to estimate viscosity at high temperatures (900 - 1550°C) of them. The results showed that although ashes from sugarcane bagasse contain silica, most of its SiO2 is from soil contamination. Higher and lower silica samples treated at 1350°C for 20 minutes showed that the fine portion of fraction of the ashes melted at this temperature. The melting phase could act as sticking flux for the coarse silica particles on the gasifier bottom wall, which could compromise the gasification process. (a) Nanoparticles of SiO2 absorbed by sugarcane bagasse, (b) microparticle of SiO2 in the fibers of bagasse after processed in the mill, and (c) particles of SiO2 from the soil not melted, and glass phase formed by the reaction of nano SiO2 and other nutrients elements of the plant such as K, Na, Ca, P, and Fe at 1350 oC/20 min. The Institute for Technological Research (IPT) is interested in the development of the gasification process (Figure 1). Gasification produces synthetic gas or syngas (H2 + CO2 + N2 + CO2 + H2O + CnHm) which can then be converted into energy, Fischer Tropsch biodiesel or monomers. It has higher energy efficiency when compared to other uses of bagasse and can produce important base chemicals . Gasification is very flexible to raw materials, allowing for local development. The greatest challenge is to overcome the initial investment barrier, and lowering the current evaluation of US$3/W to US$1.2/W that would make it commercially competitive . A project involving the construction and operation of a gasification pilot plant, one of the questions raised is the melting temperature of the ashes from bagasse and/or straw used as a feedstock fuel. 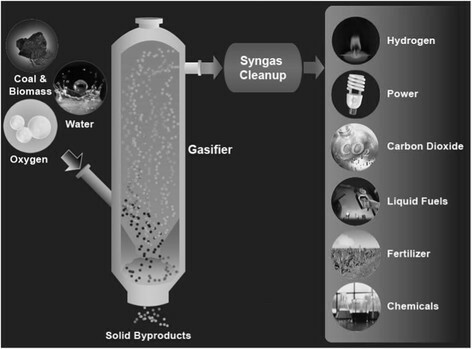 Gasification process (fuels, raw-materials, by-products, gasifier agents, and syngas applications), adapted from DOE/USA – Department of Energy. Sugarcane bagasse, as biomass, will be used in this work, due to its availability and promising potential. Brazil is the largest producer of sugarcane, with production concentrated in its South-Central region. Currently, the bagasse is used in boilers in the mills to produce energy and heat with typical 45% carbon content (dry mass) . Brazil’s sugarcane industry association (UNICA) reported that the amount of crushed surgarcane in the South-Central region in 2013/14 was 596.936 Mt, about 12% up from the 532.758 Mt produced in 2012/13  that generated approximately 118 Mt of wet bagasse. Even considering its utilization as fuel for energy generation (typically in steam boilers) in the production mills, Perrone et al. report that there is still a 12% surplus of biomass that will increase proportionally with the increase of ethanol production, requiring solutions and innovative ideas in order to generate new economic value and opportunities for the sugar and alcohol industry. Elements including N, P, K, S, Ca, Mg, Fe, Zn, B, Cu, Mn, Cl and Si considered as macro-, micro- and functional nutrients are essentials for increasing and sustaining crop yields . At high temperatures these elements in bagasse or straw are involved in reactions leading to ash formation . The temperature inside the gasifier should be sufficient to melt the ash that will be deposited on the wall of the gasifier forming a liquid slag which should flow out from the bottom of the gasifier . The typical temperature for highly efficient processes should be bellow than 1500°C. Entrained flow gasification works with liquid (bio-oil) or sub-millimeter solid particles (bagasse or straw particles). Entrained flow consists of a vertically placed cylindrical reactor at the top of which fuel (bio-oil or biomass) and a gasifying agent (air or O2) are inserted through a nozzle, usually in a swirling flow, forming a flame that carries either particles or droplets through the reactor as they undergo incomplete combustion, i.e. gasification. Residence times are small, temperature and pressure can as be high as 1500°C and 40 bar, respectively, ensuring low tar production . The aim of this work is to analyze the ash from sugarcane bagasse generated from sugarcane mills in some regions of the São Paulo State – Brazil. The results obtained in this research will provide inputs for determining the preferred processing conditions for the gasifier. Bagasse from four different sugarcane mills in São Paulo State – Brazil were collected from the stock area of the mills, in the period of December 2011 to December 2012 and were used for the study (Table 1). Currently, the bagasse presents ~50% moisture content. They were dried at 80°C for 48 h for obtaining bagasse on a dry weight basis (about 2% humidity). Initial scanning electron microscopy (FEI-Quanta 3D FEG-SEM) was used to evaluate the shape and morphology. A small assortment of each bagasse sample was deposited on carbon tape secured on brass stubs and then coated with a thin layer of gold. The qualitative analysis of the chemical elements was performed using an energy dispersive spectrometer (EDAX System). The secondary electron images were taken using a voltage of 5 to 15 kV. (*)SP – São Paulo State – South-east Brazil. Twenty grams of bagasse were heat treated at 600°C for 30 min to generate ashes. Each experiment was repeated 10 times for each bagasse under the same conditions and the percentage of generated ashes was given as the average of them. The samples collected from different mills were named with the following identification: BA, BI, BRP and BS. Ash samples from Araraquara region that were entirely processed in the IPT’s laboratory were named BAL and they were used for comparative purposes. In this case, the BAL sample stalks were milled in the laboratory and were dried at 80°C for 48 h for obtaining bagasse on a dry weight basis (about 2% humidity). Finally, they were heat treated at 600°C for 30 min. Table 1 shows the ash sample identifications and their mill. Ashes were analyzed by X-ray diffraction (Shimadzu XRD 6000, using Co Kα radiation), X-ray fluorescence pressed powder pellet technique (Philips, model PW 2404), scanning electron microscopy (FEI-Quanta 3D FEG-SEM) coupled to an energy dispersive spectrometer (EDAX System), and sieving analysis for particle size distribution. The computer thermodynamic package FactSage 6.4, in the modulus Glass database, was used to calculate the viscosity of the ash as a function of temperature from 900°C to 1550°C. About 0.2 g of ash was compacted in a stainless steel mold with a 0.5 cm diameter. The resulting cylindrical samples were put in an alumina boat crucible with 5 cm in length and were heat treated at 1350°C for 20 min in order to analyze the fusibility behavior of the ashes. The surfaces of the heat treated samples were analyzed by scanning electron microscopy using a JEOL-SEM model JSM 6300, coupled to an energy dispersive spectrometer Noran System. The temperature of 600°C was chosen to burn out all carbon and to prevent as much as possible the loss of potassium . 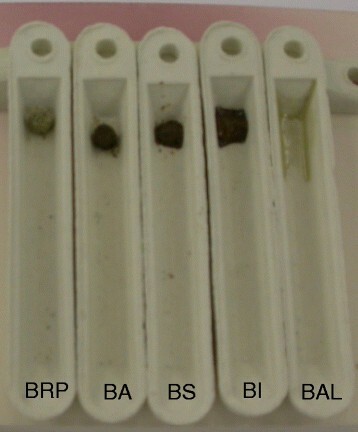 Figure 2 shows the results of ash percentage from the bagasse samples (BA, BAL, BI, BRP and BS) on a dry weight basis. It can be observed that the amount of ash is in the range of 4 to 6 wt% and is agreement with some data reported in the literature ,, although one publication indicates a percentage of ash as high as 20 wt% . An interesting fact was that the amount of ash resulted from the heat treatment of BAL is smaller than that obtained from the heat treated bagasse from the sugar mills, including BA bagasse. The reasons for this discrepancy will be discussed later. Percentage of ash resulting from heat treatment at 600°C/30 min. of bagasse BA, BAL, BI, BRP and BS. Table 2 shows the chemical composition of the ashes obtained by X-ray fluorescence (XRF). The ashes from bagasse collected in the sugar/ethanol mills present high amounts of SiO2, as high as 56 wt%, and low amounts of alkaline oxide, P2O5 and Al2O3. On the other hand, the BAL bagasse presents low amounts of silica (~11 wt%) and Al2O3, and high amount of alkaline and earth alkaline oxides (K2O, MgO and CaO). The contents of macro and micronutrients for plant growth Fe2O3, ZnO, CuO, Cl (chloride) and MnO was also determinate. Boron and Nitrogen were not determined by X-ray fluorescence since they are considered light elements. Na2O < 0.1, ZnO < 0.02, CuO < 0.02, MnO < 0.2. As can be seen in Figure 3 the XRD patterns show a significant difference between the ashes from bagasse processed in the mill and in the laboratory. The ashes from bagasse BA, BRP, BI and BS present SiO2 in the form of quartz as the mainly crystalline phase, while the primary phase for the ash from BAL is potassium chloride, followed by potassium sulfate and silica appears as a minor crystalline phase, consistent with the chemical composition showed in Table 2. It is known that silicon is considered a beneficial element to plants and is absorbed through the roots as silicic acid. Malavolta  reported that stalks are richer in K (109 kg/ha) than in Si (98 kg/ha), which is only in agreement with BAL bagasse. XRD patterns of the ashes resulted from the heat treatment at 600°C/30 min of BA, BAL, BI, BRP and BS samples. 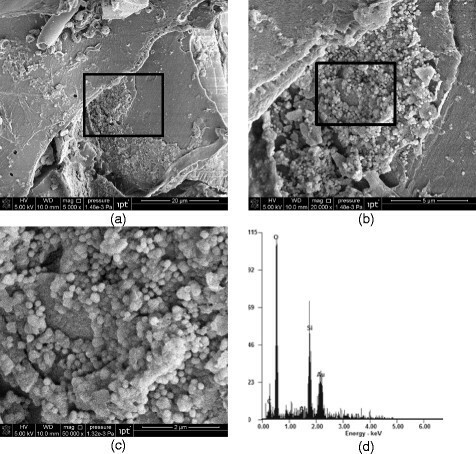 Figure 4 shows SEM micrographs of BA bagasse and exhibits spherical nanometer scale, SiO2 rich particles that can be attributed to absorbed silicon from the soil by sugarcane. Sugarcane harvesting in Brazil is done in two ways: by machine and by manual process after sugarcane burning (São Paulo State law does not allow sugarcane burning from June to November due to increased air pollution). In both cases there is soil contamination of the sugarcane, especially in times of rain, as in the Brazilian summer, when bagasse samples for this study were collected. Although in some sugar and alcohol mill plants occurs the washing process of the sugarcanes, it seems not very effective in removing all their soil impurities. When the shredded sugarcane passes through several mills in the plant production of sugar and alcohol, soil particles become trapped in the fibers of the sugarcane. SEM micrographs (SE image) of bagasse BA: (a), (b) and (c). The squares represents the magnified area; (d) EDS microanalysis from area (c). The micrograph shown in Figure 5, obtained by scanning electron microscopy, shows a particle rich in Si and O, confirming the presence of soil contamination in bagasse after the milling process. Thus the SiO2 present in the ash composition of the BA, BI, BRP and BS bagasse is a combination of silicon oxide from soil contamination and from absorbed silicon from the soil in the sugarcane. This is one of the reasons for the discrepant results of ash amount obtained from bagasse collected in plant mills -. 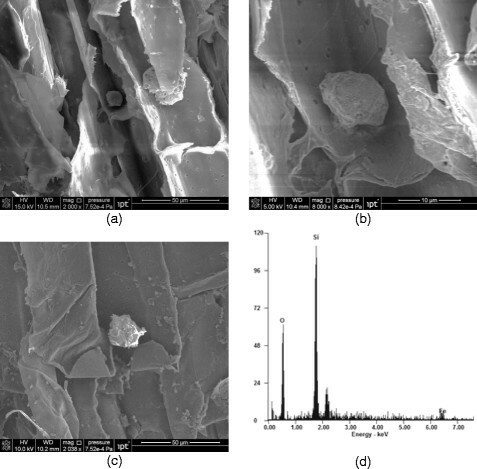 (a) SEM of bagasse BA, (b) magnified area from (a), (c) SEM of bagasse BA in different region of (a) and (d) EDS of the particle presented in (b). Table 3 presents the particle size distribution of the ashes. Except for BAL ash, the others present particles with sizes greater than 40 μm (# 325 mesh) and significant amounts of particles in the 53 to 88 μm (+270 – 170 mesh) size range. 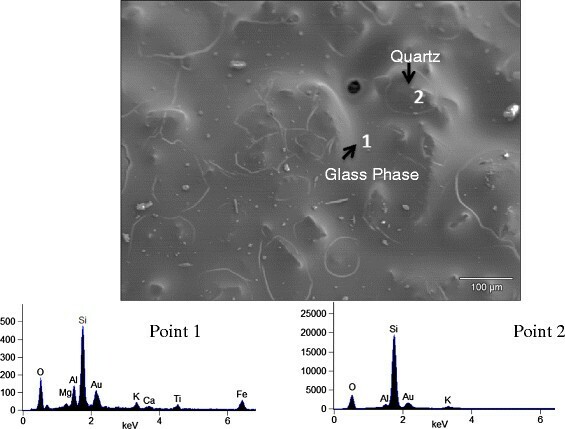 It can be seen in Figure 6 that particles of BA ash in the 53 to 88 μm range exhibit the typical rounded morphology of quartz sand grains from soil (Figure 6b) . Reflected light microscopy of the -170+270 mesh (-88+53 μm) fraction in ash (a) BA and (b) soil from Araraquara area. Patterson and Hurst  proposed that a silica ratio of 100SiO2/(SiO2+ Fe2O3 + CaO + MgO) < 80 is required for entrained flow gasifiers, if the SiO2 amount is high, a flux is required for decreasing the ash viscosity, and to minimize the flux amount a SiO2/Al2O3 ratio of 1.6-2.0 is optimal. Table 4 presents the relations proposed by Patterson and Hurst for the ash from BAL, BI, BS, BA and BRP. As can be seen, only ash from BI and BAL has an index lower than 80. However, regarding the SiO2/Al2O3 relation all ashes present indices higher than 2.0. According to Peterson and Hurst , all bagasse from the stock area of mills (BA, BRP, BI and BS) should be mixed with flux to produce an ash with optimal viscosity for an entrained flow gasifier. It is known that viscosity can only be used as an indication of slag in the gasifier, and that the melting characteristic of ash is generally lower in reducing atmosphere -. Iron is the principal fluxing element that controls ash melting under reducing conditions . We have used the Fe2O3 and its equivalent FeO values presented in Table 2 to calculate ash viscosities using the FactSage 6.4 a database computing systems in chemical thermodynamics. The results could be a guide to evaluate bagasse quality for gasification. For software calculations, chloride and SO3 were not considered, since they are not available on FactSage database software. Although P2O5 is also not available, it was added to SiO2, since it is a glass former. 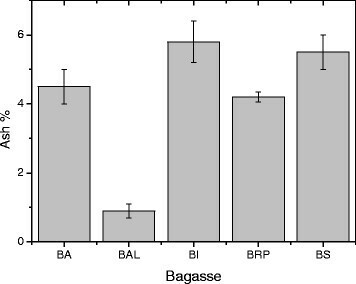 Figure 7 presents the curve of calculated viscosity for the ash from BRP, BA, BS, BI and BAL. Higmann and Burgt  reported that to ensure continuous flow, a slag viscosity less than 25 Pa.s is necessary at temperatures lower than 1400°C. 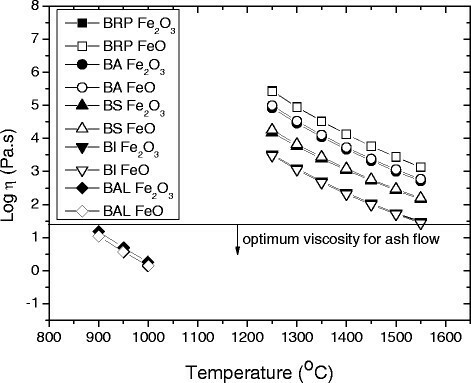 As can be seen in Figure 7 the calculated viscosities of the ash from BRP, BA, BS and BI at 1350°C are 2.7x104 Pa.s, 8.7x103 Pa.s, 1.6x103 Pa.s, and 0,5x103 Pa.s, which are very high. The viscosity of ash BAL is lower than 25 Pa.s (log η ~ 1.4 Pa.s) at 900°C. Figure 8 shows the ash samples heat treated at 1350°C, and it is possible to observe the difference on viscosity from it. Wang and Massoudi  reported that one possibility to obtain viscosity lower than 25 Pa.s is to increase the gasifier operating temperature, that however can lead to a reduction of the overall efficiency of the process. Even for temperatures as high as 1550°C, for the samples from the stock area of mills, only the ash from BI presented a viscosity near 25 Pa.s (log η ~ 1.4 Pa.s). Great differences in viscosity were not observed when using FeO instead of F2O3 on the chemical composition of the ashes. Ash viscosity as a function of temperature for the ashes from BRP, BA, BS BI and BAL, calculated by FactSage using the data from Table 2 . Samples of ashes BRP, BA, BS, BI and BAL heat treated at 1350°C/20 min. Figure 9 shows that to obtain a viscosity close to 25 Pa.s, an addition of 35 wt% and 15 wt% of CaO, as flux, should be added to the BRP and BI, respectively . There are some difficulties with the utilization of flux when the biomass is bagasse due the difficulty in homogenizing it with the flux. Furthermore, it is reported that with flux addition all the ash must be melted and more heat is required for greater ash content, thereby reducing gasifier efficiency . 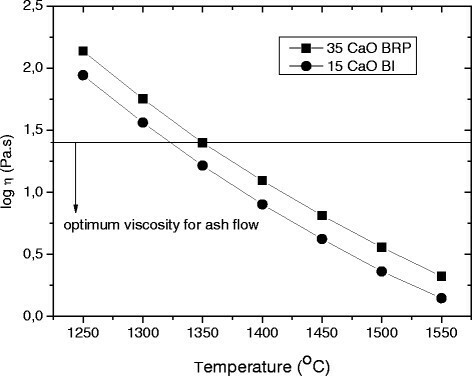 Ash viscosity as a function of temperature for the ash from BRP and BI, calculated by FactSage, using the data from Table 2 , with addition of 35 wt% CaO in BRP and 15 wt% CaO in BI. 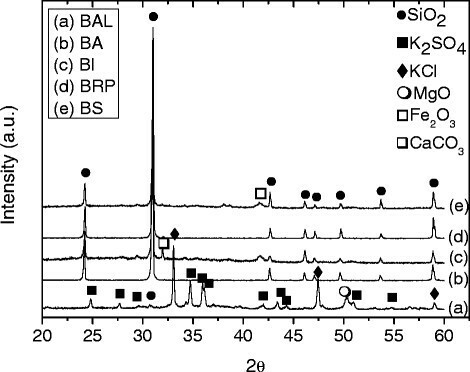 In Figure 10 and Figure 11 are shown the surfaces of the BRP and BI ash samples, heat treated at 1350°C/20 min in an oxidizing atmosphere (air). The ashes from BRP and BI represent high and the low amounts of silica (quartz), respectively, of the bagasse from the stock area of mills. It can be seen that particles of SiO2 are surrounded by a glass phase resulting from the reaction of the components of the fine fraction of the ash, consisting of the plant nutrients (SiO2, Al2O3, K2O, CaO, MgO, P2O5, and Fe2O3, for example). Surface of the BRP ash sample, heat treated at 1350°C/20 min. Surface of the BI ash sample, heat treated at 1350°C/20 min. If bagasse BA, BI, BRP and BS would be used for gasification, as received, coarse particles of SiO2 could became stuck and tightened on the inner and bottom walls of the gasifier, which could be dangerous for the process since the agglomeration of quartz particles on the bottom wall could cause a blockage of the gasifier. This could lead to severe unscheduled shutdowns and high operation maintenance costs . It is necessary to find technological and economically feasible alternatives for removing silica from bagasse before its gasification processing. The ashes from sugarcane bagasse processed in the sugarcane mills from São Paulo State present quartz as the main crystalline phase from soil contamination. On the other hand, the ash from bagasse cleaned and processed in laboratory has potassium chloride and potassium sulfate as principal the crystalline phases, and SiO2 as a minor phase. 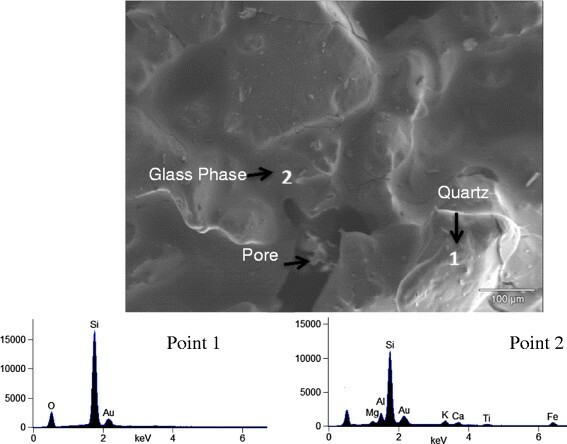 Analysis from scanning electron microscopy of the surface of ash samples from mill bagasse heat treated at 1350°C for 20 minutes showed that the fine fraction of the ashes melt at this temperature and act as flux for coarse quartz sintering. This can cause aggregation of SiO2 on the bottom wall of the gasifier that can compromise the process when using sugarcane bagasse as biomass for gasification. It is very important to study possibilities for removing soil contamination before bagasse processing. The authors kindly thank the Sugarcane Mills from São Paulo State - Brazil for donating the sugarcane bagasse, Ruben Spitz from Brown University, Claudia Maria G. de Souza and Miguel Papai Jr. of the The Center for Chemistry and Manufactured Goods – CQuim – for the X-ray fluorescence analyses. All authors have contributed substantially to the work. They read and approved the final manuscript.